With its wealth of pristine waterways, cruising is the perfect way to explore Western Australia’s spectacular coastal sights. 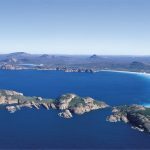 WESTERN AUSTRALIA’S North West has a fascinating history. Over two billion years in the making, its landscapes have been home to Indigenous peoples for some 30,000 years, with the first European explorers arriving in the 1600s. 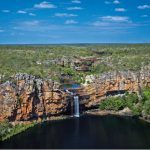 It is one of the world’s last true wilderness areas and home to the Kimberley, the inspiration for Australia (the movie) and the number one place to go for an authentic outback adventure. 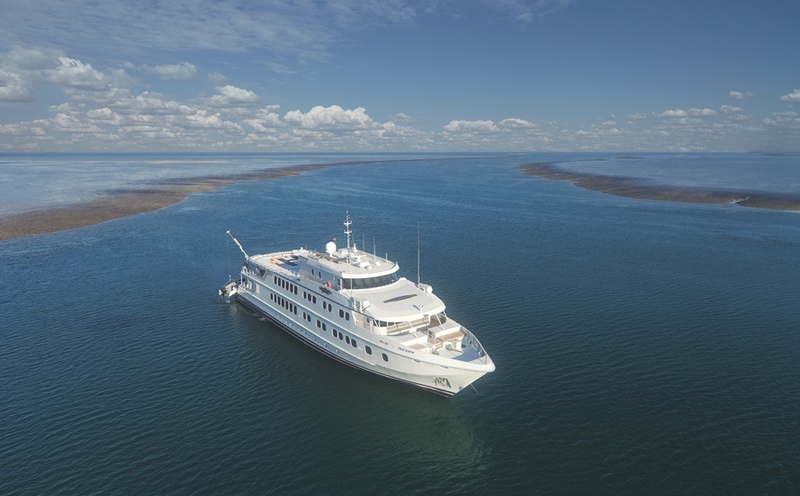 By air, both Darwin and Broome have international connections so checking out the cruising experience before bringing your own vessel here is simple. 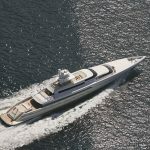 There are a number of five-star vessels offering comprehensive charters throughout the region to places only accessible by boat or helicopter. The region offers unprecedented cruise opportunities in a place that’s been little changed since prehistoric times. Australia’s North West has a rich mining history. Gold was first discovered in the 1880s, natural gas and iron ore in the late 1960s, and diamonds in 1970. Visit some of the world’s largest open cut mines and watch in wonder as the world’s longest trains hurtle past. Cossack, on the Pilbara region’s Point Samson Peninsula, was the first pearling port in the North West. This began the boom times in Broome, with over 300 pearl luggers plying the waters for the huge Pinctada Maxima oyster. This area continues to produce 80 percent of the world’s renowned South Sea Pearls. 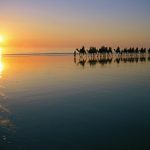 From Broome, venture into red-earth country by four-wheel drive, take a scenic flight over extraordinary rock formations and magnificent waterfalls, or cruise through the inland waterways that permeate the region. 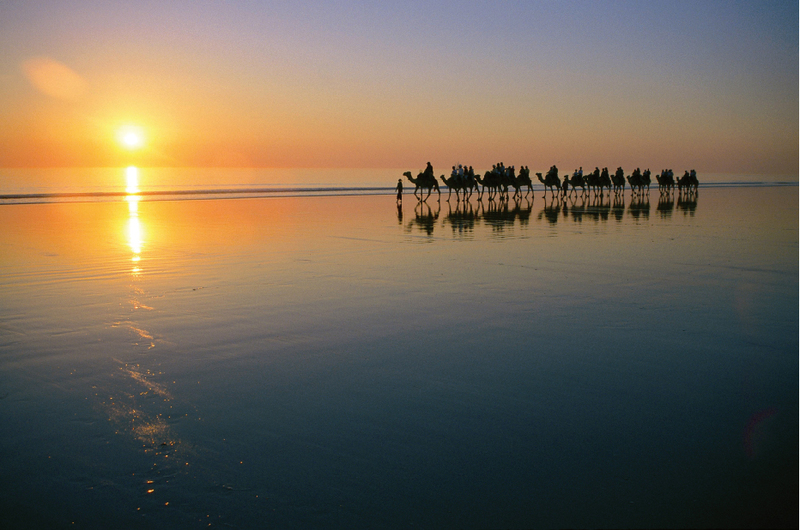 Explore the dinosaur footprints preserved in rock or simply relax on the timeless stretch of glimmering white sand at Cable Beach. 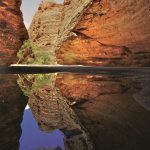 Highlights of Australia’s North West include the Bungle Bungle Range, the rocky landscapes of Karijini National Park, the many ancient gorges featured along the Gibb River Road, and Lake Argyle, a mass of water large enough to be classified as an inland sea. If angling is your thing, take your pick from some of the best barramundi fishing spots in Australia, located in the northern coastal areas, or head out on a boat to the pristine Dampier Archipelago off the Pilbara coast. 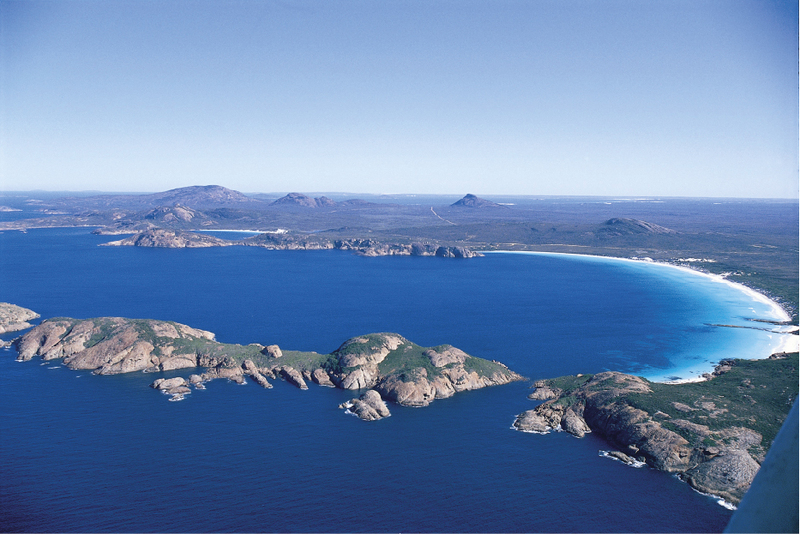 The North West region is rich in pioneer history and Australian Aboriginal culture. 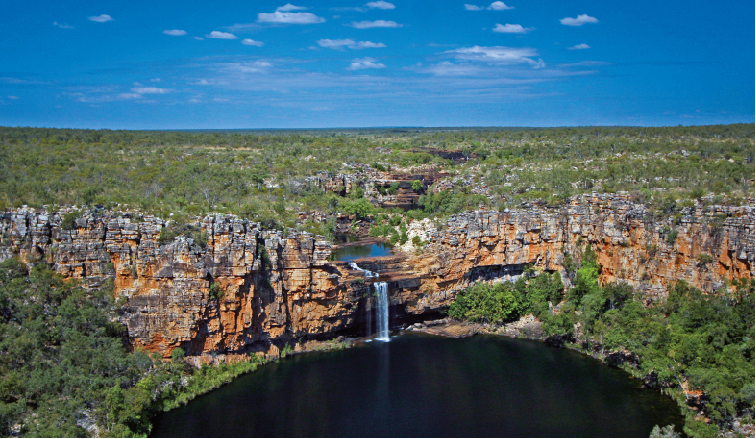 Dampier boasts the highest density of rock art in the world, and there are pockets scattered throughout the Kimberley. Beaches, exotic marine life, national reserves and the bluest ocean you’ll see anywhere in the world can all be found on Australia’s Coral Coast. This coastline region commences at Cervantes, where you’ll find the unique rock formations of the Pinnacles, and stretches as far north as Exmouth, home of the World Heritage-listed Ningaloo Reef, as well as Naval Pier, which is listed as one of the top 10 dive sites in the world. This amazing area rivals the Great Barrier Reef. 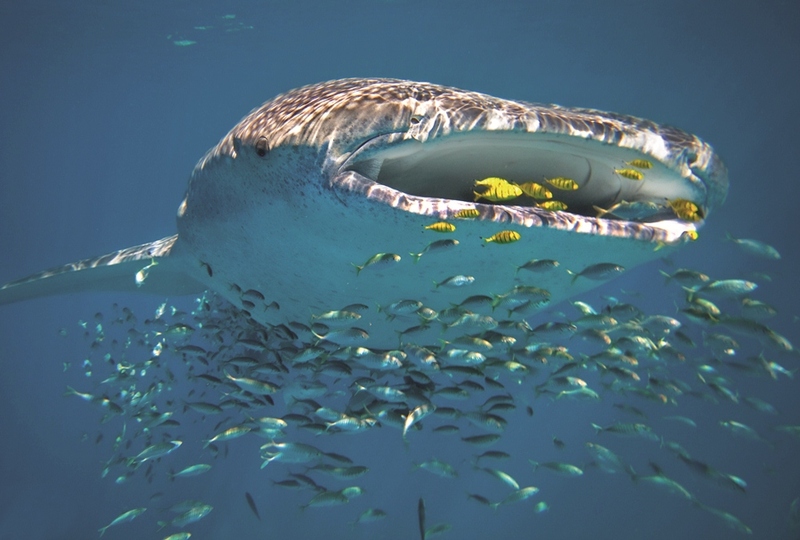 Swim in warm turquoise waters with a whale shark – the world’s largest fish – and walk the white sandy beaches. 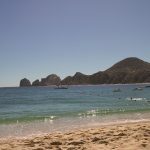 The untouched coral, amazing range of sea life and excellent visibility make for unforgettable diving and snorkelling. 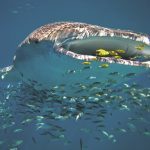 Further south, from Geraldton, the hub of Western Australia’s crayfishing industry, fly or cruise to the Abrolhos Islands, where you’ll find fascinating history, secluded beaches and sheltered snorkelling waters. Inland, the desertscape of Nambung National Park is home to the strange limestone pillars called the Pinnacles. One of Western Australia’s most magnificent and accessible national parks is Kalbarri. Steep gorges, carved out of the rugged red terrain over millions of years, provide amazing trekking and awesome scenery to capture on film. 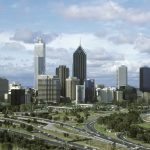 Some of the country’s best beaches, plenty of nightlife, bustling markets, inner city parks, outdoor dining and the modern city of Perth, Western Australia’s capital, sit beside the widest stretch of the meandering Swan River. For an awesome view of the river and city, head to Kings Park’s Federation Walkway, where you can wander among the treetops in a 400 hectare natural park. 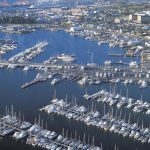 On the coast, Fremantle, one of the best-preserved 19th century cities in the world, takes you back in time, while its marine heritage draws you to the ocean. 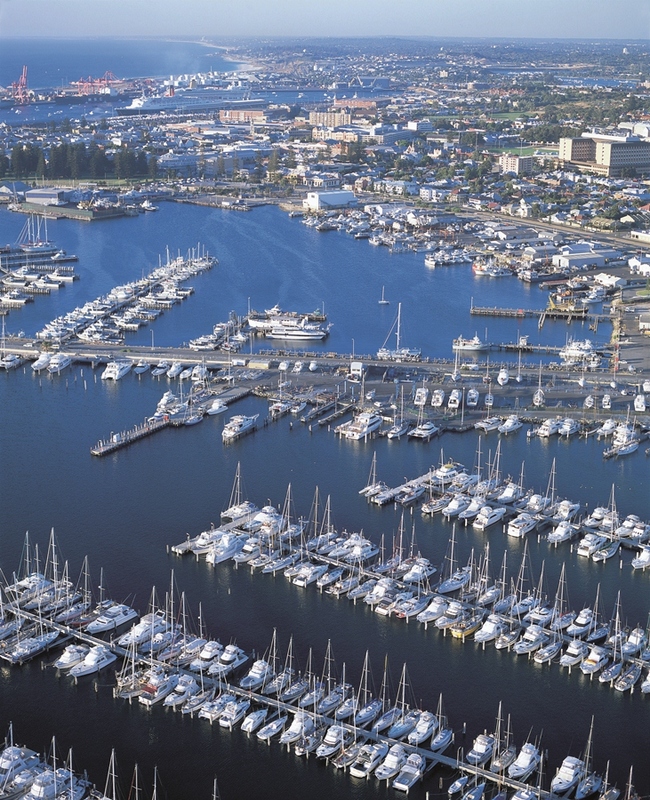 South of Fremantle lies Australia’s largest collection of shipbuilding businesses. 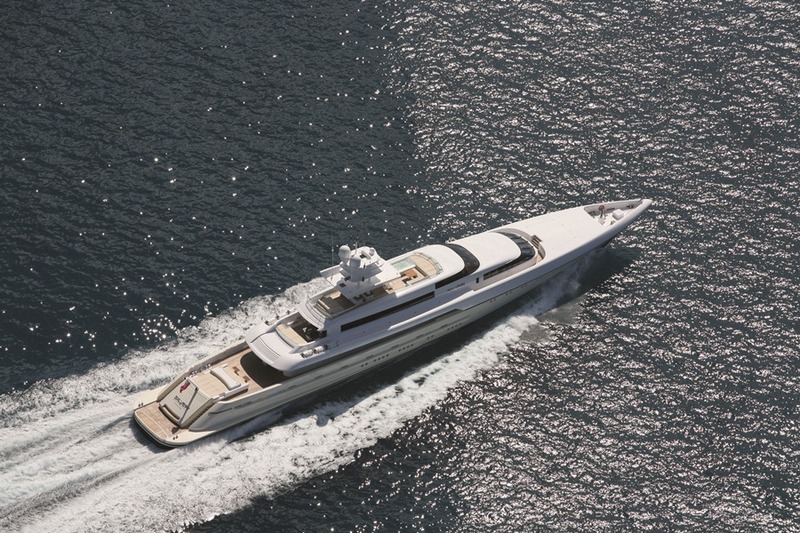 This is where the well-known brands of Austal, Oceanfast, Hanseatic and Vikal are based. Endless beaches stretch from Fremantle up past the famous Cottesloe Beach towards Lancelin, Western Australia’s windsurfing and sandboarding mecca. Head over to Rottnest, an island just off the coast, to be soothed into a state of total relaxation among sheltered bays and stunningly clear crystal waters. 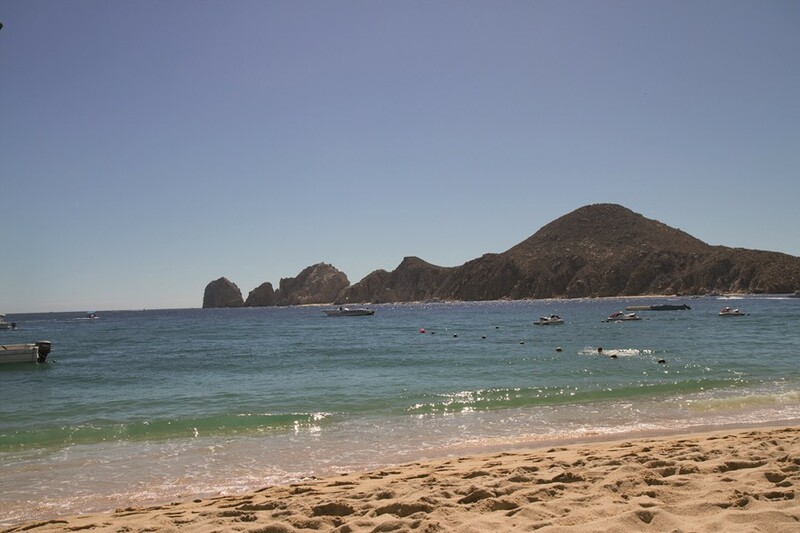 Surfing, fishing and diving are all great ways to relax here. Inland lies the sweeping Swan Valley, a showcase for local produce, including premium wineries and art galleries. Adventurers travelling further east won’t be disappointed either, as rafting on the Avon River, hot-air ballooning, skydiving and abseiling are all on offer. 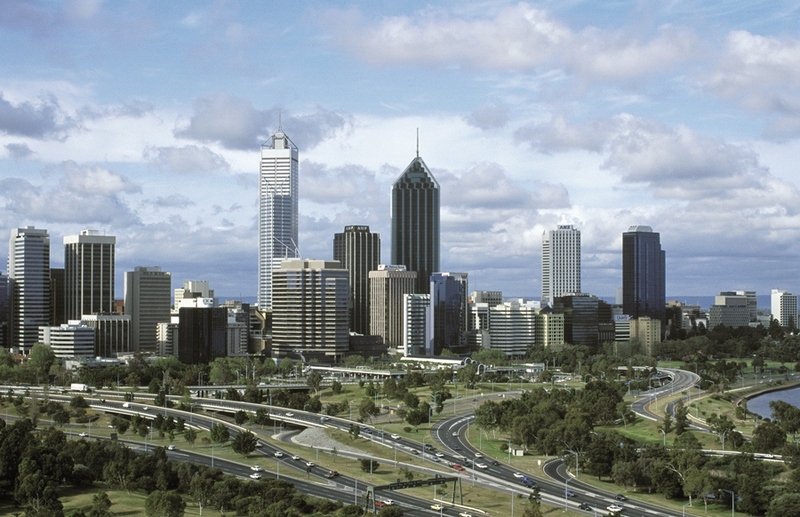 Australia’s South West was chosen by Lonely Planet as one of the world’s Top 10 Regions for 2010. The journey south along the western coastline brings you to the ocean paradise of Margaret River with its legendary surf breaks. The Margaret River wine region is an adventure playground boasting amazing fishing, diving, snorkelling and sailing experiences. The beautiful limestone caves nearby also attract many visitors. There’s an array of first class wines, fresh produce and unforgettable gastronomic delights to be discovered at the region’s fine dining restaurants, casual cafes and cellar doors. From towering forests to whale watching. 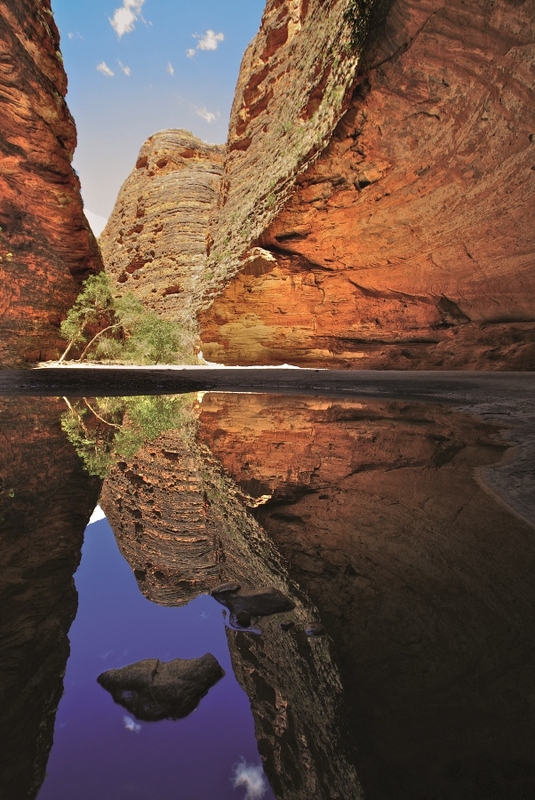 Australia’s South West offers some of the most varied travel experiences in Western Australia. A huge drawcard for scuba divers is the HMAS Swan dive wreck, also visible to snorkellers from above the ocean surface. The Busselton Jetty, almost two kilometres long, and Underwater Observatory provide another amazing view of the colourful world beneath the sea. Further south, in Albany, are even more fascinating diving experiences, including the HMAS Perth dive wreck. But this buzzing town is better known for its whaling history, now preserved in an oceanside museum. Whale-watching boat trips are a must along the Southern Ocean and right up to Augusta on the Indian Ocean coast. After canoeing on the Blackwood River, do the Valley of the Giants Tree Top Walk, suspended 40 metres above the forest floor in Walpole, or see the wildflowers in the Stirling Range National Park. Linking the whole region is the Bibbulmun Track, a walking trail that stretches more than 1000 kilometres from Perth to Albany. There really is something for everyone in Western Australia.